Placenta previa occurs in 0.3-2.0% of all births. This range in the reported incidence results from differing definitions, methods of diagnosis, and gestational ages at the time of diagnosis. In addition, the frequency varies in different patient populations. In the United States, the incidence of placenta previa is reported to be slightly higher in minority populations. Increased maternal age is a known risk factor for placenta previa. Low lying, in which the edge of the placenta lies abnormally close to but does not abut the internal cervical os. The reported incidence of placenta previa in the second trimester is nearly 10 times that at delivery. Various explanations have been proposed to account for this difference. The most likely theory suggests that, during the third trimester, the lower uterine segment elongates more than the placenta enlarges. Thus, a placenta that appears marginal or low lying at 20 weeks may be normally positioned at term. Results of most investigations of this phenomenon, however, indicate that a complete placenta previa in the second trimester rarely reverts to a normal position at term. Historically, placenta previa was diagnosed by means of digital palpation of the placental tissue through the cervical canal. The slightest amount of manipulation, however, may result in a substantial amount of hemorrhage. Physical examination should be performed only with a fetus that has achieved pulmonary maturity and only in a fully staffed operating room. Maternal bleeding may be so severe that immediate delivery is necessary. Usually, the placenta is relatively homogeneous. Its signal intensity on T1-weighted spin-echo images is low and slightly higher than that of the myometrium. On T2-weighted spin-echo images, placental tissue has high signal intensity, and it is clearly distinguishable from the adjacent fetus, uterus, and cervix. Sagittal images best demonstrate the placental position in relation to the internal cervical os. Occasionally, endometrial veins may be seen at the margins of the placenta. Normal physiologic placental calcifications, which occur during late pregnancy, usually are not seen on MRIs. 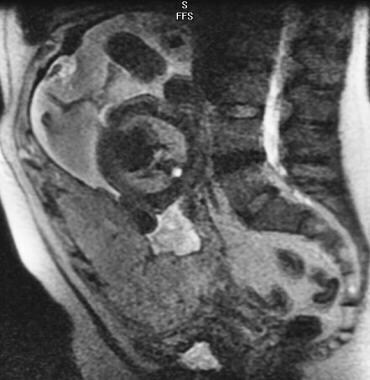 Sagittal T2-weighted image (SSFSE) depicts a complete placenta previa in this 28-week pregnancy. MRI has been used to evaluate placental location in a number of studies. Its accuracy is equivalent to and may even surpass that of sonography. To the authors' knowledge, no large prospective studies have been performed to examine the accuracy of MRI in the diagnosis of placenta previa. Several series have shown that results are similar and possibly slightly better than those of ultrasonography. The authors did not find reports of false-negative results in the literature, and only a few accounts of false-positive findings have been reported. False-positive findings may result from myometrial contraction in the lower uterine segment at imaging. Although the placental margin remains distinct from the contracted muscle and the internal cervical os, the distance between the placental margin and the os may decrease, leading to a false diagnosis of a low-lying placenta. In extreme cases, the edge of the placenta might come into contact with or even overlie a portion of the internal cervical os and thereby mimic placenta previa. Failure to diagnose placenta previa may have grave consequences during the latter trimesters and at the time of delivery. The relatively high incidence of placenta previa during the second trimester should not lead the radiologist to fail to diagnose this condition. Whenever the diagnosis is suspected in the second trimester, further evaluation is recommended. In nearly all cases, this evaluation involves repeat sonography during the third trimester. Care should be taken not to mistake a more serious situation, such as placental abruption or placenta accreta, for placenta previa, because the management of these conditions is different. In addition, the radiologist must avoid satisfaction-of-search errors. The possibility of one of these diagnoses complicating placenta previa must be excluded. The likelihood of congenital anomalies and transverse fetal positioning is slightly higher in patients with placenta previa than in others. The long-term effects of exposure to a static magnetic field and rapidly shifting gradients on fetal development have not been fully evaluated. The time required to arrange and perform an adequate examination may limit its usefulness, particularly in the setting of acute maternal hemorrhage. 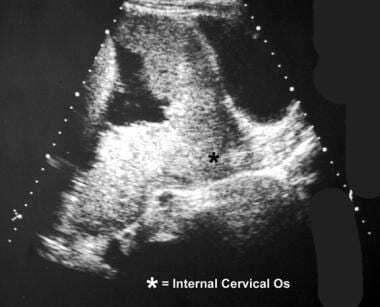 If the internal cervical os can be visualized and if no placental tissue overlies it, placenta previa is excluded. However, an attempt must be made to identify the inferior-most aspect of the placenta and to determine the distance between it and the internal os. When the fetal head obscures a posteriorly positioned placenta or when the inferior placental margin is not visualized with transabdominal imaging, a transvaginal or transperineal approach is nearly always adequate in revealing its position. Longitudinal transabdominal sonogram demonstrates complete symmetric placenta previa. Ultrasonogram shows asymmetric complete placenta previa. Follow-up examination should be performed after the patient has voided to prevent false-positive results. 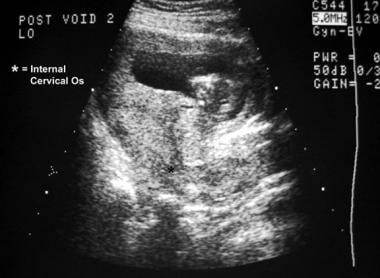 An overdistended bladder may have the appearance of placenta previa. This finding is more common when the placenta is anterior. Postvoiding longitudinal sonogram shows that the findings in a patient are not related to an overdistended bladder but rather to a true placenta previa. The conditions that are most commonly misdiagnosed as placenta previa are an overdistended bladder and myometrial contractions. Overdistention of the maternal urinary bladder places pressure on the anterior aspect of the lower uterine segment, compressing it against the posterior wall and causing the cervix to appear elongated. Thus, a normal placenta may appear to overlie the internal os. The cervix should be no longer than 3-3.5 cm during the third trimester. If the cervical length exceeds 3.5 cm or if a falsely elongated cervix is suspected, further imaging should be performed after the patient empties her bladder. Because transvaginal and transperineal imaging is performed when the patient's bladder is empty, this pitfall should occur only rarely. During a myometrial contraction, 2 situations that mimic placenta previa may occur: First, the wall of the uterus may thicken and imitate placental tissue. Second, the lower uterine segment may shorten and bring the inferior edge of the placenta into contact with the internal cervical os, creating a condition that mimics placenta previa. To avoid this pitfall, a contraction should be suspected if the myometrium is thicker than 1.5 cm. Findings from repeat imaging performed after 30 minutes should be sufficient to exclude this condition. Care should be taken when diagnosing placenta previa during the second trimester. This condition is reported to be 10-100 times as common in the second trimester as it is at term. Although the underlying physiology remains somewhat controversial, the disparity remains a fact. When placental tissue lies near or over the internal os in the second trimester, repeat imaging should be performed at a later date to confirm the diagnosis. The likelihood of congenital anomalies and transverse fetal positioning is slightly higher in patients with placenta previa than in others. Special care should be taken to document such findings. The major limitation of sonography in the diagnosis of placenta previa is related to the gestational age at diagnosis. Scott JR. Placenta previa and abruption. In: Danforth DN, ed. Obstetrics and Gynecology. 8th ed. Philadelphia, Pa: Lippincott, Williams, & Wilkins. 1999: 407-18. Sorokin Y. Obstetric hemorrhage. In: Ransom SB, ed. Practical Strategies in Obstetrics and Gynecology. Philadelphia, Pa: WB Saunders. 2000: 311-20. Worthington BS, Yuh WTC, Stark DD, et al. Obstetrics. In: Stark DD, ed. Magnetic Resonance Imaging. 3rd ed. St Louis, Mo: Mosby-Year Book. 1999: 591-615. Bhide A, Prefumo F, Moore J, et al. Placental edge to internal os distance in the late third trimester and mode of delivery in placenta praevia. BJOG. 2003 Sep. 110(9):860-4. [Medline]. Levine D, Barnes PD, Edelman RR. Obstetric MR imaging. Radiology. 1999 Jun. 211(3):609-17. [Medline]. Levine D, Edelman RR. Fast MRI and its application in obstetrics. Abdom Imaging. 1997 Nov-Dec. 22(6):589-96. [Medline]. Nagayama M, Watanabe Y, Okumura A, et al. Fast MR imaging in obstetrics. Radiographics. 2002 May-Jun. 22(3):563-80; discussion 580-2. [Medline]. Thorp JM Jr, Councell RB, Sandridge DA, Wiest HH. Antepartum diagnosis of placenta previa percreta by magnetic resonance imaging. Obstet Gynecol. 1992 Sep. 80(3 Pt 2):506-8. [Medline]. Masselli G, Brunelli R, Casciani E, Polettini E, Piccioni MG, Anceschi M, et al. Magnetic resonance imaging in the evaluation of placental adhesive disorders: correlation with color Doppler ultrasound. Eur Radiol. 2008 Jun. 18(6):1292-9. [Medline]. Maher MA, Abdelaziz A, Bazeed MF. Diagnostic accuracy of ultrasound and MRI in the prenatal diagnosis of placenta accreta. Acta Obstet Gynecol Scand. 2013 May 28. [Medline]. Peker N, Turan V, Ergenoglu M, Yeniel O, Sever A, Kazandi M, et al. Assessment of total placenta previa by magnetic resonance imaging and ultrasonography to detect placenta accreta and its variants. Ginekol Pol. 2013 Mar. 84(3):186-92. [Medline]. Masselli G, Gualdi G. MR imaging of the placenta: what a radiologist should know. Abdom Imaging. 2013 Jun. 38(3):573-87. [Medline]. Dedes I, Ziogas V. Circular isthmic-cervical sutures can be an alternative method to control peripartum haemorrhage during caesarean section for placenta praevia accreta. Arch Gynecol Obstet. 2008 May 1. [Medline]. American College of Radiology. Role of imaging in second and third trimester bleeding. In: ACR Appropriateness Criteria. Reston, Va: American College of Radiology. 2001. Dashe JS, McIntire DD, Ramus RM, et al. Persistence of placenta previa according to gestational age at ultrasound detection. Obstet Gynecol. 2002 May. 99(5 Pt 1):692-7. [Medline]. Hertzberg BS, Bowie JD, Weber TM, et al. 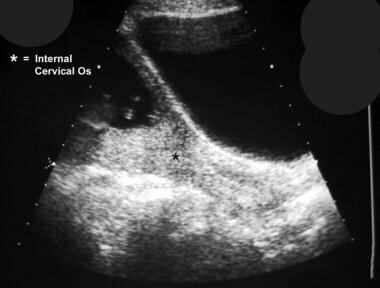 Sonography of the cervix during the third trimester of pregnancy: value of the transperineal approach. AJR Am J Roentgenol. 1991 Jul. 157(1):73-6. [Medline]. Rosati P, Guariglia L. Clinical significance of placenta previa detected at early routine transvaginal scan. J Ultrasound Med. 2000 Aug. 19(8):581-5. [Medline]. Sanderson DA, Milton PJD. The effectiveness of ultrasound screening at 18-20 weeks' gestational age for prediction of placenta previa. J Obstet Gynaecol. 1991. 11:320. Spirt BA, Gordon LP. Sonogrpahic evaluation of the placenta. In: Rumack CM, ed. Diagnostic Ultrasound. 2nd ed. New York, NY: Mosby-Year Book. 1998: 1337-58. Townsend RR. Ultrasound evaluation of the placenta and umbilical cord. In: Callen PW. Ultrasonography in Obstetrics and Gynecology. 3rd ed. Philadelphia, Pa: WB Saunders. 1994: 440-65. Hertzberg BS, Bowie JD, Carroll BA, et al. Diagnosis of placenta previa during the third trimester: role of transperineal sonography. AJR Am J Roentgenol. 1992 Jul. 159(1):83-7. [Medline]. Tanimura K, Yamasaki Y, Ebina Y, Deguchi M, Ueno Y, Kitajima K, et al. Prediction of adherent placenta in pregnancy with placenta previa using ultrasonography and magnetic resonance imaging. Eur J Obstet Gynecol Reprod Biol. 2015 Apr. 187:41-4. [Medline]. Algebally AM, Yousef RR, Badr SS, Al Obeidly A, Szmigielski W, Al Ibrahim AA. The value of ultrasound and magnetic resonance imaging in diagnostics and prediction of morbidity in cases of placenta previa with abnormal placentation. Pol J Radiol. 2014. 79:409-16. [Medline]. Yoon SY, You JY, Choi SJ, Oh SY, Kim JH, Roh CR. A combined ultrasound and clinical scoring model for the prediction of peripartum complications in pregnancies complicated by placenta previa. Eur J Obstet Gynecol Reprod Biol. 2014 Sep. 180:111-5. [Medline].